After a thousand miles using the Clement MSO tires, and an unfortunate rim shredding with forgotten brake pads, it was time to rebuild my wheels. 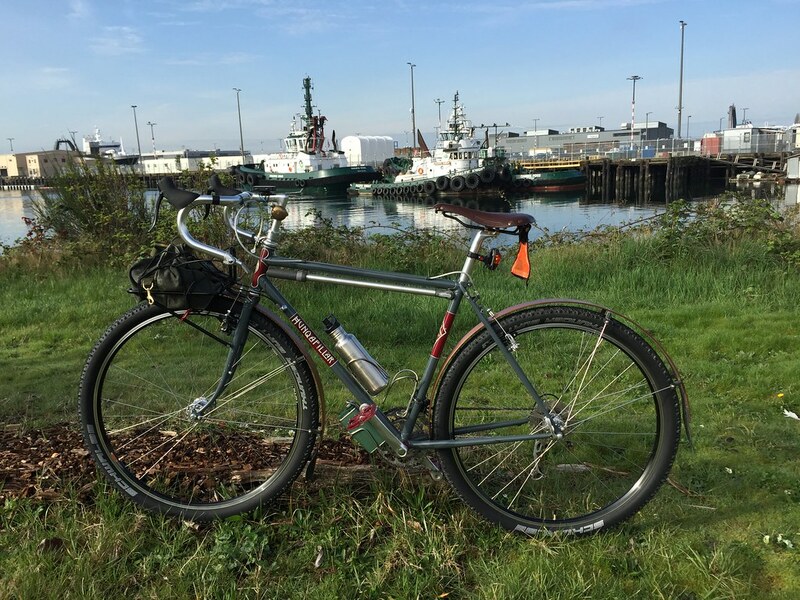 I really like the Clements, so they will likely go back on after the Oregon Outback, but the bike is built for bigger tires, and I have a couple bikes that are lighter and more roadish. This is a mountain bike at heart. I did a bit of research and decided to try out WTB ChrisCross rims. They seemed to be a good combination of strength and weight, and had the requisite black look I was wanting for this bike. They luckily happened to be the same ERD (604mm) as the outgoing Velocity Synergies, so I was able to try out the rim swap trick re-using the old, perfectly good spokes. 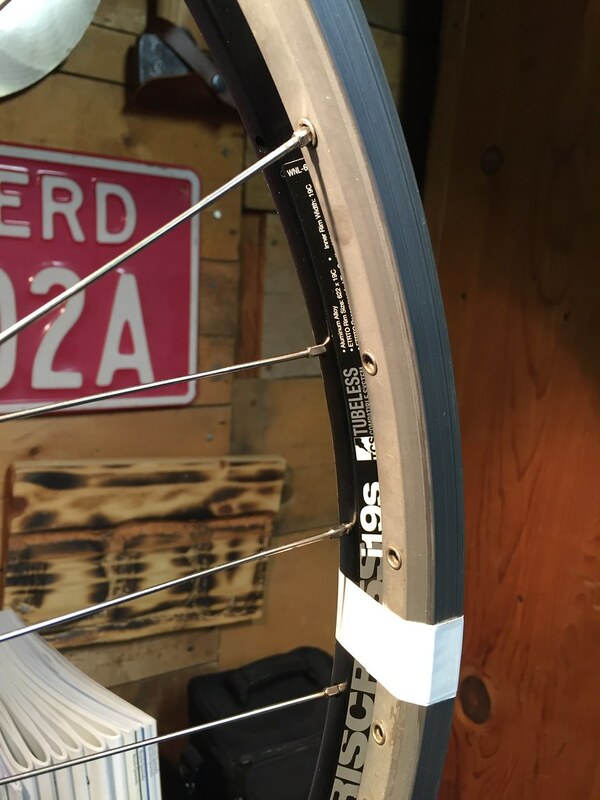 Rim swap – tape, loosen, and start switching rims! 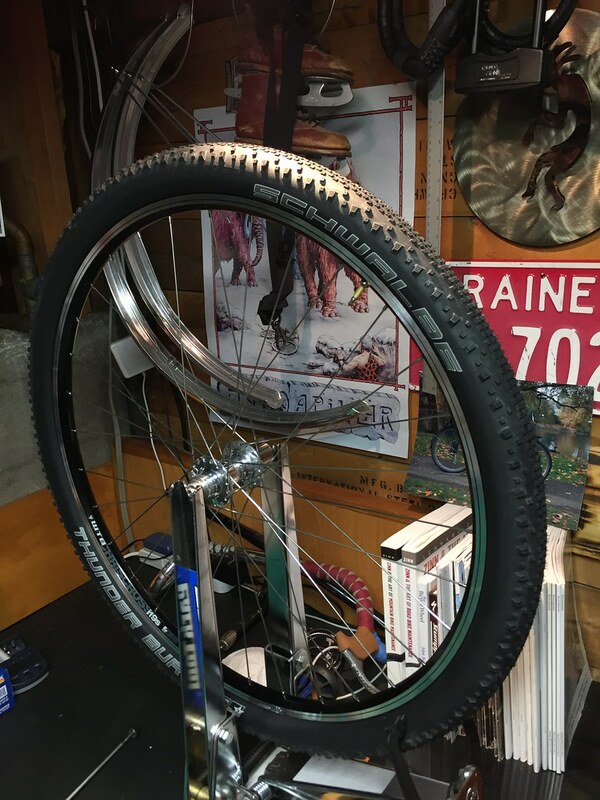 As I’ve had good luck with tubeless Hetres on my Toussaint, and I definitely want to avoid flats with the bigger tires on the long trips, I built these up sans-tube. I only had the thin Stans tape that just covered the spoke holes. The tires I picked for these guys are the Schwalbe Thunder Burts. 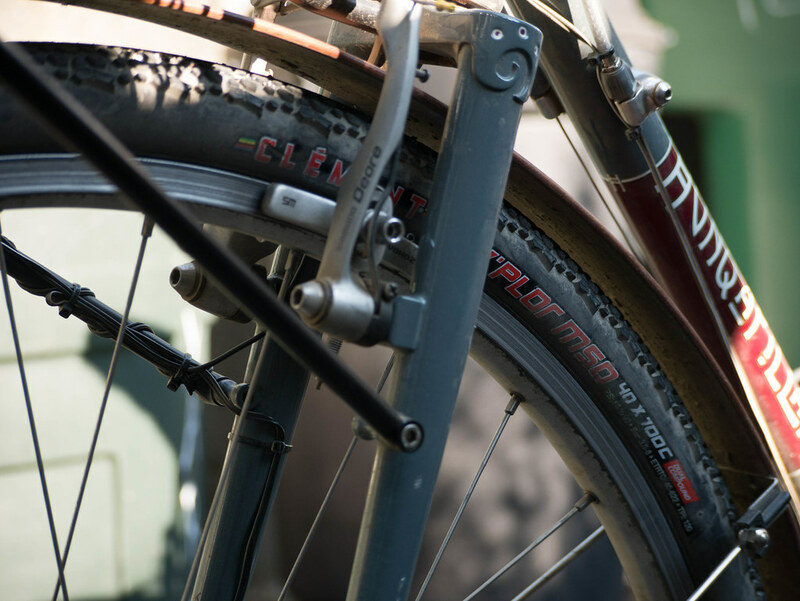 They are tubeless-ready tires, but fit the rims rather loosely. I knew I would need extra tape, but it took two additional layers. I used one round of Gorilla tape on one rim, but I had to trim it to fit in the well. I went over it with a round of vinyl tape that worked so well, I just used the vinyl twice round on the other wheel. 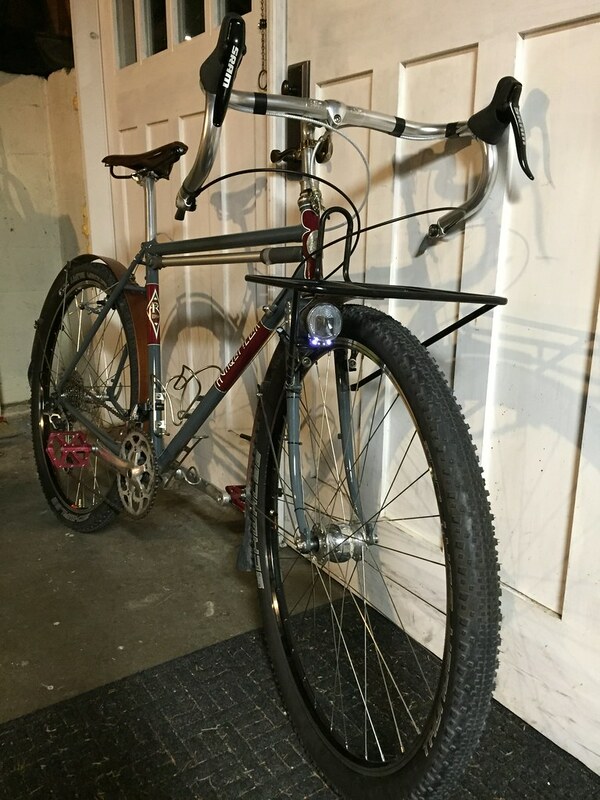 Once I had a few layers built up, the tires popped in with the air compressor, and I added Stans for a fully loaded tubeless wheel. I had to re-adjust the fenders back out 10mm to take into account the expanded diameter of the new wheel. Until I got the tires on, I wasn’t sure if I would be able to run with fenders over these giant tires. 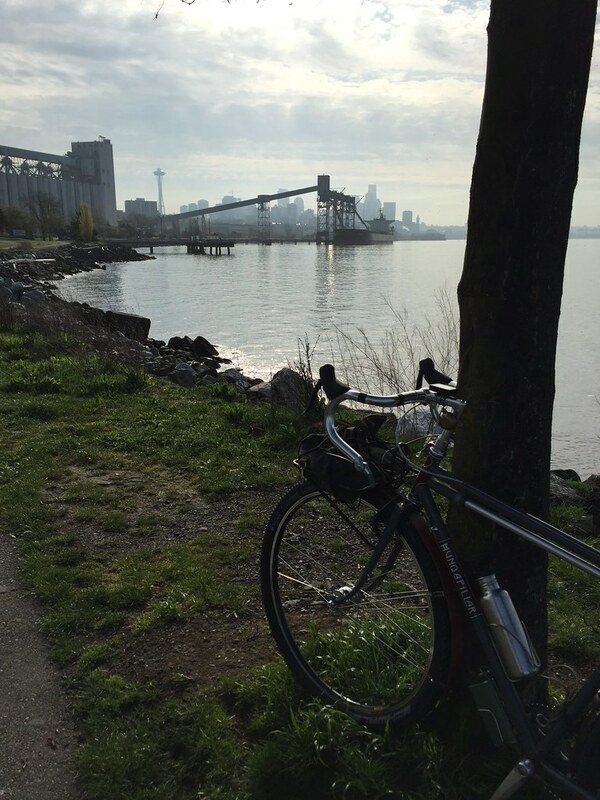 I’m still wary, as new knobbies tend to pick up lots of debris, but the first ride was uneventful. The new tires are definitely beefy. Reminds me of that big off-road mountain bike feel I fell in love with in ’91 when I re-discovered off-road riding. They appear to ride really smoothly on asphalt, and they soak up the bumps even better than the Hetres on my other bike. In the tubeless config, they likely weigh in the same neighborhood, too! Hetres: 412g + tube (150g) compared to Thunder Burts: 435g. Now I just need a few more long dirt rides to sort this guy out. The bars feel pretty far out – this guy has a long top-tube, and drops accentuate the reach. Once I get it dialed in, the tape will go on and the mammoth will be ready for new adventure. These measure to about 50mm right now – perhaps a few more with the knobs. It looks like the Hunqapillar will take about another 5mm on each side. I would say 55mm would be max with some room. These tires would be a bit wider with a wider rim. Thanks! were these the 2.1 or 2.25 tires you mounted? Cool, thanks! I tried mounting a friend’s pair of 2.25’s in my Atlantis this morning and was shocked to discover they fit! Ordered some for myself on the spot. Sounds like a great tire.